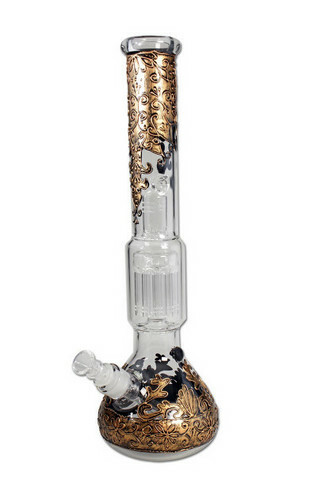 This awesome and decorative percolator bong with its bronze-colored design elements is a little reminiscent of steampunk or even the Rococo era. And it's perfect for use at any fantasy larp! The ice bong is made of very stable 5mm thick borosilicate glass and handpainted with heat-resistant paint. The sophisticated cooling technology inside the bong makes you think of Steampunk again. The bowl for herbs and whole blossoms sticks in a down-pipe diffuser slit adapter causing first water and smoke swirls. Then the smoke has to go through a 10-arm tree percolator, followed by a cylinder slit diffuser which serves also as a splash guard. For the final cooling effect, the already well filtered steam passes through the filled ice chamber before being inhaled very pleasantly smooth tasting. More cooling and filtering is hardly possible! There is a kickhole with plug, the mouthpiece is pleasantly rounded and the weight of the bong gives stability - full steam ahead!